Open Tuesday through Friday, from 1 p.m. - 5 p.m. Dive into Lake Tahoe without getting wet! 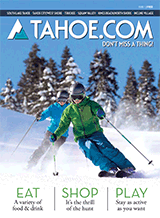 Explore the interactive exhibits that feature Lake Tahoe. Great activity for children and adults and alike. Explore why Lake Tahoe is so unique on a guided tour. Learn about the latest scientific research on the virtual research vessel. Discover Lake Tahoe’s underwater life in the laboratory exhibit. Build mountains and make it rain in the “Shaping Watersheds” interactive sandbox. Put on your 3-D glasses and take a tour around and into Lake Tahoe to discover “Lake Tahoe in Depth” in our 3-D theater. For hands-on science activities and more, come visit Lake Tahoe’s only public science center in Incline Village, Nevada. TOUR TIMES: Tours available at 1, 2, 3 and 4 p.m. Tuesday through Friday (Saturdays during the peak season and by appointment). LOCATION: The UC Davis Tahoe Science Center is located on the first floor of the Tahoe Center for Environmental Science building at 291 Country Club Drive, Incline Village, Nevada (on the campus of Sierra Nevada College). PARKING: There are five visitor parking spaces located in the Sierra Nevada College campus parking lot off County Club Drive outside the Tahoe Center for Environmental Sciences building. If no visitor parking spaces are available, you can place the stub of your ticket in your windshield and park in a non-visitor space or obtain a parking permit at the front desk. COST: Admission free. $5 suggested donation per adult visitor.